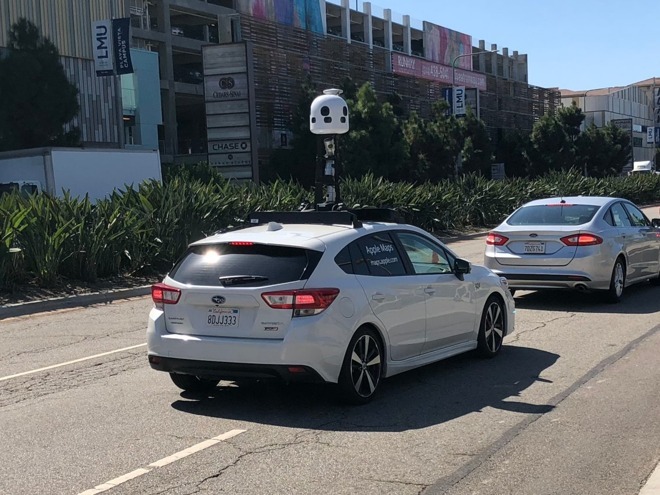 Apple is reportedly deploying a new vehicle, the Subaru Impreza hatchback, to its fleet of vehicles driving the world to collect first-party Maps data. Marked white Imprezas have been seen around Los Angeles, according to Business Insider. Although the cars are smaller, they're also distinguished by a new, extremely tall sensor rig, presumably housing standard equipment such as cameras and LIDAR. Until now Apple has been relying on minivans. The Maps recon fleet is notably separate from the Lexus SUVs Apple has deployed for its self-driving car program. Apple finally revealed that its vehicles were being used to create first-party maps in June. The company's Maps app started out with data from Google Maps, but ditched Google content in 2012 for a hodge-podge of sources including TomTom. Apple has frequently been criticized for missing or displaying inaccurate information, though complaints have diminished considerably in the past six years. As a part of its improvements, the company is hoping to be faster to cope with road and construction changes, while also displaying more detail.